I’ve also learned that M. Graham’s line of acrylic paint is as vibrant, luscious, and fun to use as is Golden’s line (but easier on the wallet). Having already fallen in love with their watercolor line, I decided to check out the reviews on Blick for Graham acrylics, and they all said pretty much what many of us have learned about the Graham watercolors: You get a whole lot for your money, and you don’t sacrifice quality one iota. In fact, you may wind up preferring Graham paint to some other more expensive lines. Definitely worth considering! I hope you are enjoying some gorgeous temperate weather, as we are of late. Take some deep breaths and enjoy! Peace. You’re much wiser than you realize, 3D. Thank you so much for your kind visits, encouragement and sharing your knowledge so graciously and generously. 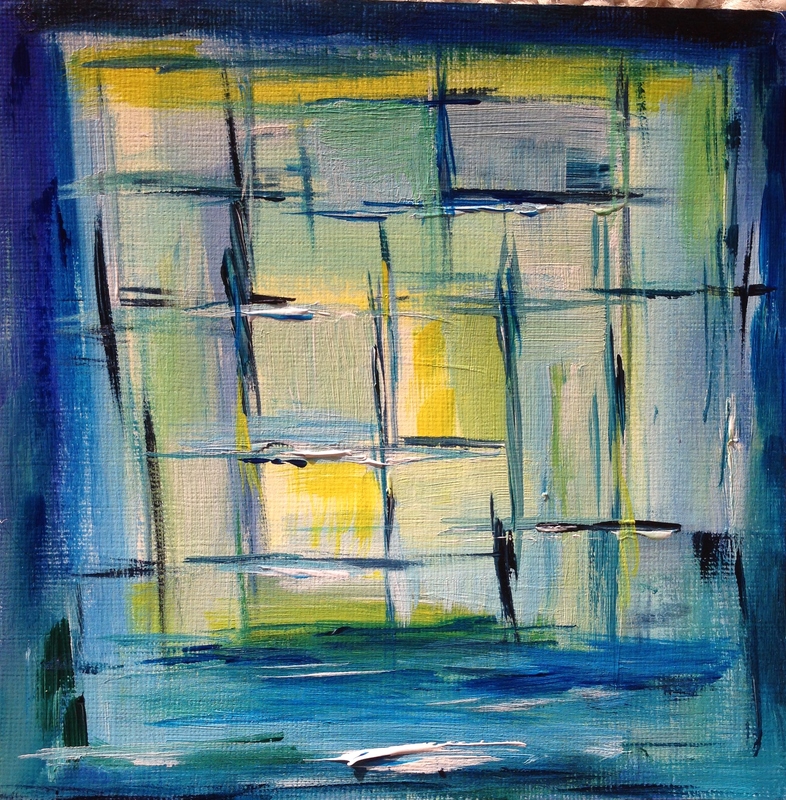 Well said Laura, most expensive is not always best, love the yellows and blues….giving hints of green, lush. Thanks, Kerfe! If not for you and your amazing grid collages, I bet I’d have never bought square paper! But I’m really enjoying this format and the windows. Having lots of fun with them! I can see that. It will be fun when you put them all together and see where you’ve been too! Goldens are wonderful and I think they are worth the money, Teresa. Even though they are ridiculously priced! But Graham paint, for me, is a very close second, and maybe if I’d have tried them first, who knows? So glad you like the painting. So happy to see you have had some time to create. I’ve missed you. Your use of luminous colors (especially the sunlit yellow) are superb! Thanks so much, Carol! I really appreciate your kind words! Glad you enjoyed it. Thanks so much, Myriam! Acrylic paint really is fun to play with. So glad to see you are enjoying playing with your acrylics Laura. Interesting about Graham. Golden although fantastic are like you say very hard on ones wallet. Not sure I can get Graham”s here but will keep them in mind. Thanks for that. You’re welcome, Susan and thanks for your comment! Laura, so happy I stopped by your blog, before I temporary have no Internet. “Going Back Home” to Michigan’ after wintering the last three months in Florida. I will be on the road for a few days, and then, the unpacking begins, and setting up house, food and such. As usual, your artistic muse is shining brightly. Fantastic abstract painting. Thanks so much, Connie! I’m so glad you enjoyed it. I hope you have a smooth transition to MI and get that internet hooked up soon! I love the glow to this one! Again this one feels and looks like a stain glass window. Wonderful! You are coming into your own with these compositions, Laura – love the window/observational angle they have and how that alludes to your process. Beautiful! Thanks so much, Jacob! What a kind comment! I do begin to feel like I’m “coming into my own” a bit with these pieces. As much as I love representational work, I am loving these abstracts. Really enjoying acrylics too, and never thought this would happen. Art brings continual surprises my way, and I’m really grateful for each one! Beautiful Laura, I love the overlay of color and the depth you are achieving. I can tell you are having fun. Thanks, Sharon! I really am! I am loving these abstract pieces. Really becomes a meditative inner discovery for me. Very cool. Glad you’re enjoying them too, that multiplies the pleasure! I love this piece Laura, the composition and colour choices. Thanks so much, Vicki! I really appreciate your comment and visit. These “window” paintings are fun, almost like a mini-vacation with each one. Really enjoying them. Glad you are too! Thanks, Charlie! 😀 You’re such an encouraging light! I really appreciate the paint brand tip! It’s fun to watch you exploring a new medium – is acrylic new to you, or just working on canvas? Actually, both! This one was done on paper canvas, and I’ve done a couple now on cotton canvas as well. So glad you’re enjoying them! Thanks for stopping by and letting me know!